Melissa Bliss presented two new soundworks in THE TELEPHONE TOUR, an event in Peter Stuyvesant's Ghost, a sound art and historical environment project in Manhattan curated by Lise Brenner.. It took place within the footprint of the 17th century farm of Peter Stuyvesant, the last Dutch Governor, in what is now the East Village. 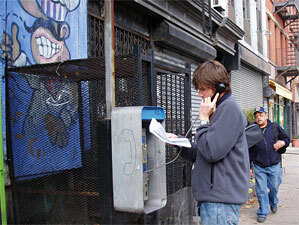 THE TELPHONE TOUR was a self-guided walk through the area of Peter Stuyvesant's farm. The soundworks, from US and international artists, could be accessed from pay phones or mobile phones at locations indicated on a downloadable map. They were also heard on Michelle Nagai's Dutch Days Radio Hour on free103point9.